Providence College had kept West Virginia University’s Da’Sean Butler, the fourth-leading scorer in the Big East Conference, in check for most of their game Saturday afternoon. Unfortunately for the Friars, Butler needed little time to make a big impact on the final outcome.Butler had a steal and back-to-back baskets during a key stretch midway through the second half that stopped a Providence rally and helped West Virginia finish off an 86-59 victory before 11,091 fans at the WVU Coliseum. 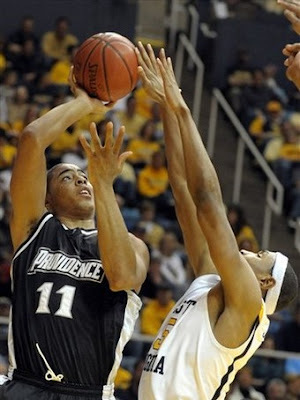 Jeff Xavier had 15 points to lead Providence (14-9, 6-5 Big East Conference). Sharaud Curry added 13 points, and Weyinmi Efejuku scored 11 for the Friars, who lost their third straight game. "We are trying, as a team, to stay as even-keeled as we can in this league," Providence coach Keno Davis said. "When you look around and see Top 20 teams (like Notre Dame) who can lose seven games in a row, it is just that kind of league this year. Our margin of error isn’t great right now." Alex Ruoff scored 24 points, including six 3-pointers, to lead West Virginia (16-7, 5-5), which stopped a two-game losing streak. Butler had 17 points, Devin Ebanks added 13 and Darryl Bryant also was in double digits with 10 points. Providence, which trailed by 19 points early in the second half, made it 57-46 following Xavier’s two free throws with 10:20 left. A basket from Ebanks pushed West Virginia’s lead back to 13 points. That’s when Butler, who started the game averaging 21.0 points in conference play, took over. On Providence’s next possession, Butler stole the ball from Efejuku and followed with a jump shot to put West Virginia ahead, 61-46. After a turnover by Curry, Butler then drilled a 3-pointer to put the Mountaineers up 64-46 with 8:39 left in the game. Providence could get no closer the rest of the way. "That was definitely the critical point in the game," Xavier said. "Once we got down by 18 points, it was tough to come back." Up until his final burst, Butler had been limited to 12 points on just 5-of-14 shooting. He had scored 20-or-more points in six consecutive games before Saturday. "He wasn’t going too crazy," Xavier said. "But he’s a great player, and he’s going to get his points." Butler said his baskets sealed the game for West Virginia. "That pretty much did it," he said. "It definitely felt good. After that, we wore them down with our energy." After tying a school record with 17 3-pointers in their loss to Villanova on Wednesday, the Friars managed only 3 in 18 attempts against West Virginia. In all, Providence shot 38 percent from the field and committed 19 turnovers. West Virginia turned those turnovers into 29 points. "I knew that we were not going to get a lot of open looks (from 3-point range)," Davis said. "I am not surprised at the pressure they put on us. I had seen enough tape that I had an understanding of Coach (Bob) Huggins’ teams and how they play and how aggressive and tough-nosed they are." Providence held the lead briefly in the first half, 7-4 with 16:05 left, following a 3-point play from Efejuku. West Virginia responded with a 17-2 run over the next five minutes to surge ahead 21-9. Ruoff had eight points during the run, including two 3-pointers, and Butler had five points, including a 3 of his own. "We just couldn’t overcome that first-half run," Davis said. "Alex is a great shooter. We knew he would knock down some shots." A basket from Jonathan Kale got the Friars within 23-18 with 7:39 left. The Mountaineers then ran off 11 consecutive points before going into halftime with a 42-27 advantage. This loss hurts the Friars more because them game was not competitive than the actual addition to the L column. With 2 games remaining against Rutgers, a road game against South Florida, and a home game against struggling Notre Dame; the Friars can still get to 10 wins in the Big East and it would be tough to keep a 10 win Big East team out of the tourney. Another positive for the Friars is that they are currently tied for 6th in the Big East at 6-5 with Syracuse and Cincinnati. As we know, they have beaten Cincinnati twice and defeated Syracuse as well, which should prove to come in handy for them on selection Sunday. Cincinnati's solid play of late definitely helps the Friars, because it makes their two victories over the Bearcats look a lot more impressive than they did earlier in the season. At this point, those are two of PC's better wins this season. Friar fans shouldn't be too worried with their teams play in the last three games because UConn(2), West Virginia(7), and Villanova(15) all rank in the Top 15 in overall efficiency and defensive efficiency as well. It might surprise some that a West Virginia team that has a record of 16-7 would be ranked as the 7th most efficient team in the nation, but all of their losses has been to top notch teams: UConn, Pitt, Louisville, Marquette, Syracuse, Kentucky, and Davidson. The Mountaineers might be able to sneak up on some teams come tournament time who don't realize how good of a team they are. The good news for PC is that 4 of their last 7 games are against teams that rank 56th or worse in overall efficiency. They pretty much need to win all 4 of those games, but judging by their recent meetings with teams ranked in the Top 15 in overall efficiency, it might be a little too much to ask for PC to beat the other three teams on their schedule: Pitt(4), Louisville(7), or Villanova(15).